What wonders lie behind our walls? Winchester’s libraries, archive and collections preserve the history of the school, and provide a unique learning resource. Artefacts acquired over the past six centuries often form the basis of a Div discussion, or are incorporated in to everyday lessons. The College Archives record the history of the school, its estates, buildings and pupils from its foundation. Uniquely, the archives are housed in the same rooms built for their storage in the 1390s, and due to the quality of that provision, remain remarkably well preserved. We welcome enquiries about all aspects of the school’s history. Some resources can now be seen online. These include registers of pupils, the school magazine (published since 1866), and a published catalogue of the archives. The archives also include details of all pupils who served in the First and Second World War. The Winchester College at War website provides information on all the pupils who fell in these two conflicts. For more information, to make an appointment to visit or to send an enquiry, please contact the College Archivist, Suzanne Foster. Moberly Library occupies a beautifully beamed 14th century building which formerly housed the school brewery and the Headmaster’s ballroom. This now forms the school’s main library, with a stock of around 30,000 items. In addition, the library subscribes to numerous online databases, as well as an extensive list of periodicals and their digital archives. Moberly Library is supplemented by the school’s separate Science and Art School Libraries. Science Library covers all aspects of Science but mainly focuses on Physics, Chemistry, Biology, Medicine and Engineering and is the home of the Natural History Society (NHS) book collection. The Art School Library covers all aspects of the fine and decorative arts, architecture and also offers a variety of film and photography equipment for the boys to borrow. For more information, please contact moberlylibrarian@wincoll.ac.uk. The Fellows’ Library contains over 10,000 rare books and manuscripts. It was established at the beginning of the 15th century, and is one of a small number of ancient libraries to have survived with part of its medieval collection in situ. The library has a particularly strong collection in Biblical scholarship, English literature, cartography, and the history of science. 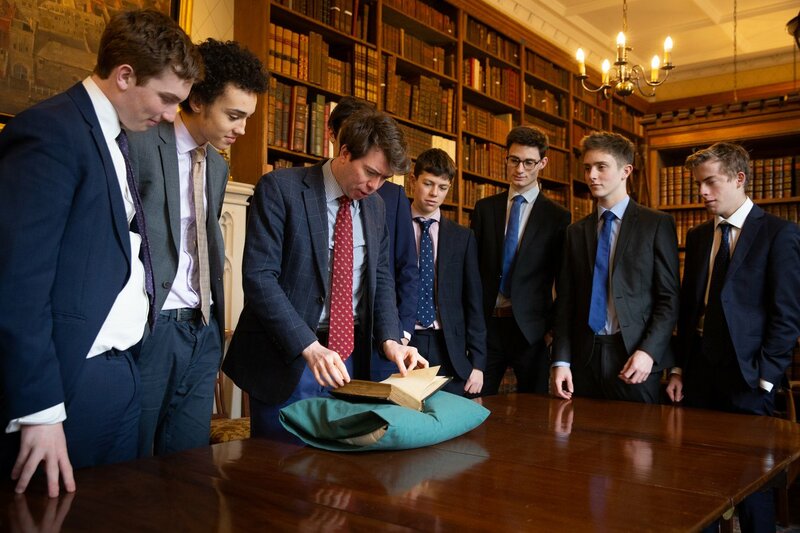 Boys have access to the library throughout their time at Winchester: Mathematicians, for example, are shown a first edition of Newton's Principia. Students of English have the opportunity to study the First Folio of Shakespeare’s plays. Musicians are able to see song books that once belonged to Elizabeth I. Information about the library’s holdings of early English books may be found by searching the English Short Title Catalogue hosted by the British Library. Winchester’s incunabula have been catalogued in detail. The library welcomes researchers. For more information, and to make an appointment, please contact fellows.library@wincoll.ac.uk. The Treasury houses the school’s collections of art and archaeology. These include artefacts from Egypt, Greece and Rome, casts of the Parthenon Frieze, and Chinese ceramics from the Tang to Qing dynasties. They are displayed in the medieval Warden's Stables, converted into a museum in 2016. Treasury is open to the boys to use with their teachers, or to explore in their own time. There is public access to Treasury from 2-4pm every day (except Monday). Tickets may be purchased at the museum, or in advance from the website or the Tourist Information Centre. Admission is £5.00 for adults, students and those under 16 are free. Group visits are welcome and enquiries should be directed to the Curator at treasury@wincoll.ac.uk.